Sidney, a 10-year-old female spayed cocker spaniel, presented with a 2-day history of lethargy, anorexia, and diarrhea. Sidney had a history of chronic keratoconjunctivitis sicca that was treated with topical cyclosporine. Two days before presentation, Sidney began refusing to eat and became lethargic. At that time, she was taken to her primary care veterinarian; basic blood analysis and urinalysis were performed (specific results not available). The urinalysis results indicated a urinary tract infection, and Sidney received amoxicillin/clavulanic acid. However, after initiation of antibiotic therapy, Sidney had loose stools that contained gelatinous red clumps. At this point, her primary care veterinarian referred her for further diagnostics and treatment. 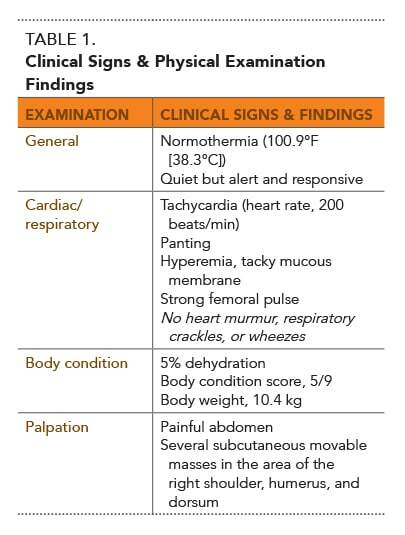 Sidney’s physical examination findings on presentation to the referral facility are listed in Table 1. 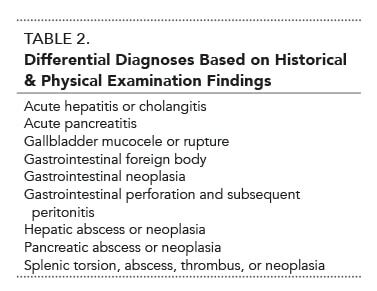 Differential diagnoses based on history, clinical signs, and physical examination findings are outlined in Table 2. 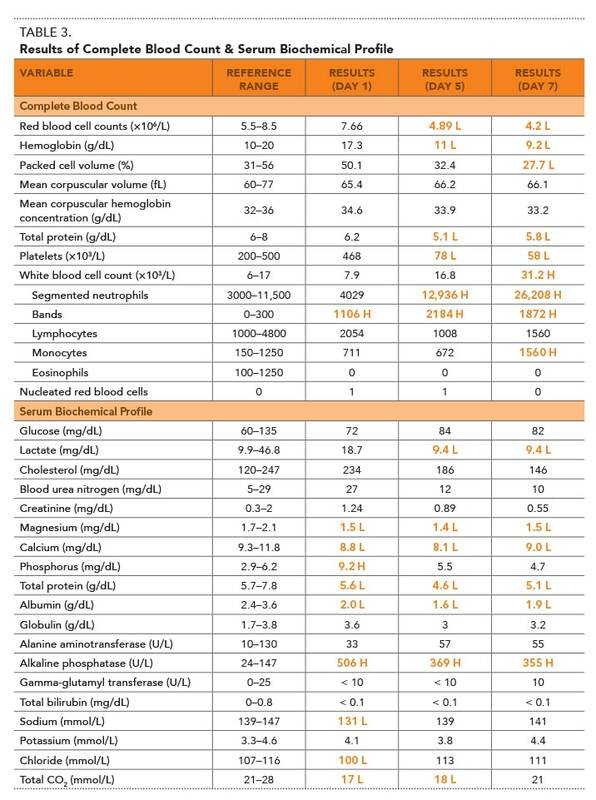 Initial workup included a complete blood count (CBC), serum biochemical profile, urinalysis, urine culture, coagulation panel, and patient-side SNAP cPL test (idexx.com); the results of the CBC, serum biochemical profile, and coagulation panel are shown in Tables 3 and 4, with abnormal results bolded. Blood and urine samples were collected before treatment was initiated. In addition, 3-view abdominal radiographs were taken to rule out a gastrointestinal (GI) foreign body and other obvious abdominal organ-related diseases. On the basis of abdominal radiography results, abdominal ultrasonography with abdominocentesis was performed. The collected abdominal fluid was prepared for analysis and cytology. The number of red blood cells (RBCs) was normal at first and mildly decreased later. The normal number of RBCs upon presentation may have been related to the mild dehydration. With aggressive fluid therapy, the patient became mildly anemic due to a dilutional effect on the number of RBCs. Moderate thrombocytopenia together with the coagulation panel results indicated disseminated intravascular coagulation (DIC). DIC can occur in patients with severe pancreatitis and other serious systemic diseases, such as sepsis due to peritonitis or neoplasia. Acute tissue injury/inflammation as a negative acute phase reactant (eg, pancreatitis, peritonitis). The mildly decreased total calcium was attributed to hypoalbuminemia, while the mildly decreased magnesium may have been caused by decreased GI absorption. Active bone resorption (primary or secondary hyperparathyroidism). Isosthenuria (urine specific gravity, 1.012) with mild proteinuria (sulfosalicylic acid test result, 1+) was present but, otherwise, unremarkable. Isosthenuria may have resulted from IV fluid administration during hospitalization. The urine culture was negative; this result may have been affected by the antibiotic therapy initiated 2 days prior to presentation. The antibiotic was discontinued during hospitalization because there was no evidence of a urinary tract infection and the diarrhea was considered a potential side effect of antibiotic therapy. 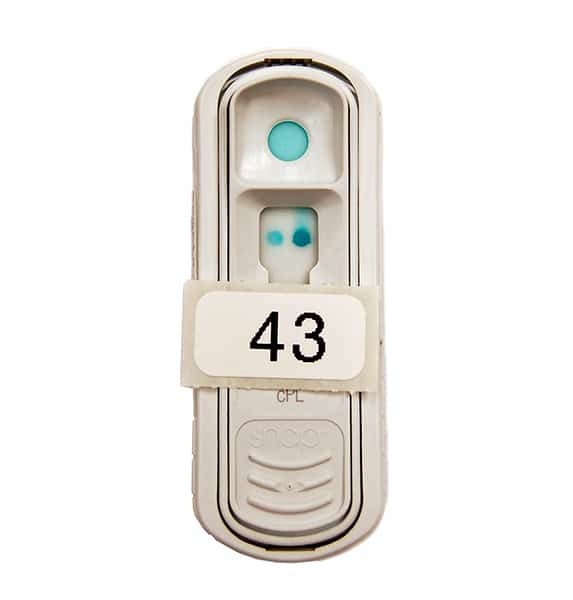 DIC was indicated on the basis of thrombocytopenia, mildly prolonged prothrombin time and partial thromboplastin time, decreased antithrombin III, and increased D-dimers, but there were no clinical signs of thrombosis or bleeding. Abnormal SNAP cPL (Figure 1) indicated a value in the gray zone (200–400 mcg/L) or one consistent with pancreatitis (> 400 mcg/L). FIGURE 1. Positive result on a SNAP cPL test. The spot on the right (patient spot) is darker than the control spot on the left side, indicating a serum cPL concentration either in the gray zone or diagnostic for pancreatitis, and requiring a serum Spec cPL test to differentiate between them. Follow-up Spec cPL (idexx.com) was 1678 mcg/L (reference range, ≤ 200 mcg/L) and, thus, consistent with pancreatitis. Loss of serosal detail in the right cranial abdomen was consistent with peritoneal effusion, while a mildly enlarged and rounded liver was consistent with hepatic venous congestion, hyperadrenocorticism, diabetes mellitus, neoplasia, or an acute inflammatory hepatopathy. Considering the patient’s clinical signs and radiographic findings, the top differential diagnosis was pancreatitis with extrahepatic biliary obstruction. However, inflammatory hepatopathy, such as a gallbladder mucocele with possible bile peritonitis or hepatic neoplasia with hemorrhagic or neoplastic effusion, were also considered differential diagnoses. Periportal, pancreatic, and gastric lymph node enlargement. These findings were most likely suggestive of pancreatitis, with no evidence of gallbladder mucocele or obvious pancreatic neoplasia. However, hepatic neoplasia could not be completely ruled out. Further diagnostic workup for possible neoplasia and other causes of enlargement of several abdominal lymph nodes was refused by the client. Findings from abdominocentesis indicated a modified transudate (total protein, 2.7 g/dL; total nucleated cell counts, 10,195/mcL). Cytology showed marked nondegenerative neutrophilic inflammation and mild histiocytic inflammation. Acute pancreatitis was diagnosed based on history, physical examination findings, nonspecific findings on general blood analysis, abnormal pancreatic lipase immunoreactivity (cPLI) based on abnormal SNAP cPL and/or increased Spec cPL results, abdominal radiographs, and ultrasonographic findings. IV fluid therapy: Lactated Ringer’s solution was initiated and adjusted on the basis of regular monitoring of hydration status. Analgesia: Lidocaine (25 mcg/kg/H) was initially given IV as a constant rate infusion (CRI), with buprenorphine added (0.4 mg IV Q 8 H). On day 3 of hospitalization, fentanyl (3 mcg/kg/H IV CRI) was started, with lidocaine and buprenorphine discontinued. Nausea control: Maropitant was initially administered alone at 10.4 mg SC Q 24 H; ondansetron was added on day 2 at 3.12 mg IV Q 12 H.
Nutritional support: Attempts were made to feed several types of commercially available low fat diets for the first 2 days of hospitalization, but Sidney was not interested in eating and seemed to be nauseated despite anti-emetic treatment. On day 3 of hospitalization, a nasoesophageal tube was placed, but the patient pulled it out. On day 4, syringe feeding with canine CliniCare (abbott.com) was tolerated. On day 5, the patient began to eat boiled chicken; CliniCare was adjunctively administered to meet daily energy requirements. Fresh frozen plasma (20 mL/kg IV) was administered over 4 hours to supplement coagulation factors on days 1, 5, and 6. Clopidogrel (18.75 mg PO Q 24 H) was administered to inhibit platelet activity. On day 7 of hospitalization, all IV fluids and medications were discontinued and Sidney was discharged on oral medications, including tramadol (25 mg PO Q 8 H), clopidogrel (18.75 mg PO Q 48 H), and maropitant (24 mg PO Q 24 H). In an attempt to prevent a recurrent episode of acute pancreatitis, an ultra low fat diet was recommended and any treats with high fat content were discouraged. Sidney was discharged after 7 days of hospitalization and was presented for a recheck 3 days after discharge. Sidney’s owners reported that she had a good appetite, and there were no signs of abdominal pain. No vomiting or diarrhea was identified. A recent study2 suggested that serum paraoxonase 1 activity, combined with triglyceride and C-reactive protein concentrations, can help evaluate disease severity, but further studies are warranted. In Sidney’s case, prognosis was poor to guarded when she was hospitalized, but upgraded to fair to good upon discharge. However, long-term follow-up was not achieved. The exact mechanism of development of naturally occurring acute pancreatitis in dogs is still poorly understood. It has been postulated that pancreatitis develops as a result of autodigestion and severe inflammation caused by inappropriate premature activation and secretion of proteases (especially trypsinogen to trypsin) within pancreatic acinar cells. Pancreatitis and subsequent peripancreatic fat necrosis can cause focal or generalized peritonitis, and most pancreatitis cases in dogs are sterile. Plasma protease inhibitors (alpha1-proteinase inhibitor and alpha2-macroglobulin). Studies in human medicine3,4 suggest that a compensatory anti-inflammatory response plays an important role in limiting progression of inflammation locally by upregulating anti-inflammatory cytokines, such as IL-10 or IL-11, but no study has been performed to confirm this in dogs. When these protective mechanisms fail to prevent damage to pancreatic acinar cells, severe inflammation is caused by secreted proinflammatory cytokines from neutrophils and macrophages. A sterile inflammatory peritoneal effusion can occur due to localized peritonitis and the coagulation cascade can be activated, resulting in DIC. Lungs, kidneys, and livers are especially vulnerable to damage, causing multiple organ failure due to extensive distribution of capillary vessels. In human medicine, multi-organ failure is recognized as having more important relation to mortality in acute pancreatitis than severity of the disease itself3,5 even though no data is available for dogs. Even with the advanced diagnostic modalities currently available, accurate diagnosis of acute pancreatitis is still challenging. Practically, acute pancreatitis in dogs is usually diagnosed with a combination of history, clinical signs, abnormally high serum cPLI concentration (as measured by Spec cPL), and abdominal ultrasonographic images consistent with pancreatitis. Concurrently, other intra-abdominal diseases that could cause similar clinical signs are excluded by assessment of laboratory test results, survey abdominal radiographs, and abdominal ultrasonography. Pancreatitis can be confirmed by cytologic evaluation of a fine-needle aspirate of the pancreas.7 Histopathology of the pancreas has traditionally been considered the gold standard for diagnosis and classification of pancreatitis. However, a recent study9 suggests that a negative finding (ie, no inflammatory lesions in the biopsy) does not rule out pancreatitis because pancreatic inflammation can be highly localized. 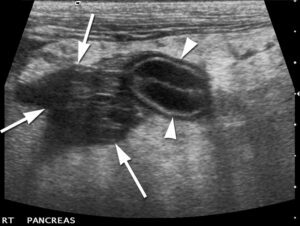 Advanced imaging modalities, including contrast-enhanced computed tomography (CECT) and contrast-enhanced multidetector helical computed tomography (CE-MDCT), have been evaluated and shown different utility for diagnosing pancreatitis in dogs. A study using CE-MDCT10 showed low sensitivity for diagnosing pancreatitis in dogs presented with acute abdominal signs even though CE-MDCT was suggested as a good screening test to differentiate between surgical and nonsurgical conditions. A more recent study11 using CECT concluded that CECT under sedation can confirm a clinical suspicion of pancreatitis. However, these modalities have limited availability for general use. Because most cases of acute pancreatitis in dogs are idiopathic, the mainstay of treatment is supportive care that includes risk factor control, fluid therapy, nutritional support, and pain control. Fluids are important to correct hypovolemia, dehydration, and electrolyte and acid–base imbalances as early as possible to prevent any systemic complications, which can be associated with a negative outcome. A study in human medicine12 suggested a possible benefit of using lactated Ringer’s solution because the alkalinizing property of that solution prevented further trypsin activation within the acinar cells, but no data are available for dogs. Gradually increasing the volume fed until the full energy requirement is reached is recommended regardless of the method of enteral alimentation. Generally, an easily digestible food is recommended. The benefit of using a low fat diet is anecdotal, but we feel strongly that an ultra low fat diet should be chosen for feeding. These diets should be fed both during hospitalization and also after discharge. If patients demonstrate severe nausea, vomiting, or abdominal pain before, during, or after feeding, enteral feeding should be discontinued and attempted later when these signs have been successfully controlled. Every dog with acute pancreatitis should be considered as having abdominal pain even if it is not clinically apparent. A multimodal approach for pain management is advised for better pain control, lower dosages, and fewer adverse effects. Most commonly used analgesics include opioids, ketamine, or lidocaine for hospitalized patients. Outpatients can receive tramadol (5 mg/kg PO Q 6–8 H), an opioid, gabapentin (5–15 mg/kg PO Q 12 H), and/or a fentanyl patch. Antiemetic treatment should be started as early as possible even in dogs without overt nausea or vomiting to encourage patients to eat voluntarily. Maropitant (1 mg/kg SC Q 24 H for a maximum 5 days), a neurokinin1 receptor inhibitor, is recommended as a first choice antiemetic due to its high efficacy and visceral analgesic properties. Dolasetron (0.6 mg/kg IV or SC Q 12–24 H) or ondansetron (0.1–0.2 mg/kg slow IV Q 6–12 H), both 5-HT3 antagonists, can also be used. Because maropitant and the 5-HT3 antagonists act on different receptors, we commonly use both types of drugs concurrently in patients with severe pancreatitis. The proposed advantage of using plasma in dogs with acute pancreatitis includes supplementation of alpha-2-macroglobulin (scavenger proteins for activated proteases in serum), coagulation factors, and anti-inflammatory factors.20 Due to the high cost and lack of confirmed benefits in dogs, however, plasma transfusion is generally reserved for dogs suspected to have DIC. Bacterial complications are extremely rare in dogs with naturally occurring acute pancreatitis. Only dogs with overt bacterial infections or a strong suspicion for such an infection should be given broad spectrum antibiotics. No prospective studies demonstrate beneficial effects of corticosteroid therapy in dogs with acute pancreatitis. Reserve corticosteroids for patients who have critical illness-related corticosteroid insufficiency causing refractory hypotension, even with aggressive fluid therapy. If identifiable, any risk factors should be discontinued or avoided when a patient has been diagnosed with pancreatitis (Table 5). Specifically, medications that have been shown to cause pancreatitis should be considered for discontinuation or replacement with another medication. Canine acute pancreatitis is a reversible disease when diagnosed promptly and managed appropriately. Avoiding known risk factors and careful monitoring after the first episode are important in prevention of progression to chronic pancreatitis or recurrent acute pancreatitis. Dr. Steiner is a paid consultant for Idexx Laboratories. 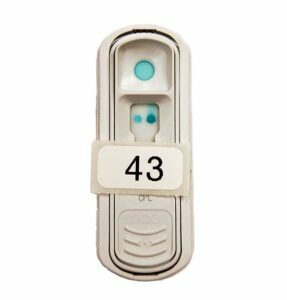 Both the Gastrointestinal Laboratory at Texas A&M University and Idexx Laboratories offer Spec cPL testing on a fee-for-service basis. Mansfield CS, James FE, Robertson ID. Development of a clinical severity index for dogs with acute pancreatitis. JAVMA 2008; 233:936-944. Tvarijonaviciute A, Garcia-Martinez JD, Caldin M, et al. Serum paraoxonase 1 (PON1) activity in acute pancreatitis of dogs. J Small Anim Pract 2015; 56:67-71. Kylanpaa L, Rakonczay Z Jr, O’Reilly DA. The clinical course of acute pancreatitis and the inflammatory mediators that drive it. Int J Inflam 2012; 360685. Talukdar R, Swaroop Vege S. Early management of severe acute pancreatitis. Curr Gastroenterol Rep 2011; 13:123-130. Banks PA, Bollen TL, Dervenis C, et al. Classification of acute pancreatitis—2012: Revision of the Atlanta classification and definitions by international consensus. Gut 2013; 62:102-111. McCord K, Morley PS, Armstrong J, et al. A multi-institutional study evaluating the diagnostic utility of the spec cPL and SNAP(R) cPL in clinical acute pancreatitis in 84 dogs. J Vet Intern Med 2012; 26:888-896. Xenoulis PG. Diagnosis of pancreatitis in dogs and cats. J Small Anim Pract 2015; 56:13-26. Trivedi S, Marks SL, Kass PH, et al. Sensitivity and specificity of canine pancreas-specific lipase (cPL) and other markers for pancreatitis in 70 dogs with and without histopathologic evidence of pancreatitis. J Vet Intern Med 2011; 25:1241-1247. Pratschke KM, Ryan J, McAlinden A, et al. Pancreatic surgical biopsy in 24 dogs and 19 cats: Postoperative complications and clinical relevance of histological findings. J Small Anim Pract 2015; 56:60-66. Shanaman MM, Schwarz T, Gal A, et al. Comparison between survey radiography, B-mode ultrasonography, contrast-enhanced ultrasonography and contrast-enhanced multi-detector computed tomography findings in dogs with acute abdominal signs. Vet Radiol Ultrasound 2013; 54:591-604. Adrian AM, Twedt DC, Kraft SL, et al. Computed tomographic angiography under sedation in the diagnosis of suspected canine pancreatitis: A pilot study. J Vet Intern Med 2015; 29:97-103. Wu BU, Hwang JQ, Gardner TH, et al. Lactated Ringer’s solution reduces systemic inflammation compared with saline in patients with acute pancreatitis. Clin Gastroenterol Hepatol 2011; 9:710-717, e711. Mansfield CS, James FE, Steiner JM, et al. A pilot study to assess tolerability of early enteral nutrition via esophagostomy tube feeding in dogs with severe acute pancreatitis. J Vet Intern Med 2011; 25:419-425. Qin HL, Su ZD, Gao Q, et al. Early intrajejunal nutrition: Bacterial translocation and gut barrier function of severe acute pancreatitis in dogs. Hepatobiliary Pancreat Dis Int 2002; 1:150-154. Petrov MS, Kukosh MV, Emelyanov NV. A randomized controlled trial of enteral versus parenteral feeding in patients with predicted severe acute pancreatitis shows a significant reduction in mortality and in infected pancreatic complications with total enteral nutrition. Dig Surg 2006; 23:336-344; discussion, 344-335. Olah A, Romics L Jr. Enteral nutrition in acute pancreatitis: A review of the current evidence. World J Gastroenterol 2014; 20:16123-16131. Jensen KB, Chan DL. Nutritional management of acute pancreatitis in dogs and cats. J Vet Emerg Crit Care (San Antonio) 2014; 24:240-250. Cassuto J, Sinclair R, Bonderovic M. Anti-inflammatory properties of local anesthetics and their present and potential clinical implications. Acta Anaesthesiol Scand 2006; 50:265-282. Steiner JM. Canine pancreatic disease. Textbook of Veterinary Internal Medicine, 7th ed. Philadelphia: Saunders Elsevier, 2010, pp 1695-1704. Weatherton LK, Streeter EM. Evaluation of fresh frozen plasma administration in dogs with pancreatitis: 77 cases (1995-2005). J Vet Emerg Crit Care (San Antonio) 2009; 19:617-622. Mansfield C, Beths T. Management of acute pancreatitis in dogs: A critical appraisal with focus on feeding and analgesia. J Small Anim Pract 2015; 56:27-39. Watson P. Pancreatitis in dogs and cats: Definitions and pathophysiology. J Small Anim Pract 2015; 56:3-12. Jörg M. Steiner, med.vet., Dr.med.vet., PhD, Diplomate ACVIM & ECVIM (Companion Animal), AGAF, is a professor in the Departments of Small Animal Medicine and Surgery and Veterinary Pathobiology, as well as director of the Gastrointestinal Laboratory, at Texas A&M University. He has authored or coauthored more than 210 peer-reviewed articles, 75 book chapters, and 330 research abstracts, and is a Fellow of the American Gastroenterology Association. He received his veterinary degree from Ludwig-Maximilians University, Munich, and completed an internship at University of Pennsylvania, residency in small animal internal medicine at Purdue University, and PhD at Texas A&M University. Chee-hoon Chang, DVM, MS, is a PhD student in the Gastrointestinal Laboratory at Texas A&M University. Dr. Chang received her DVM and MS from Chonnam National University in South Korea and completed her small animal rotating internship and specialty internship in emergency and critical care at Washington State University. She is also a small animal internal medicine resident at Texas A&M University. Her research interests include gastrointestinal and pancreatic diseases.